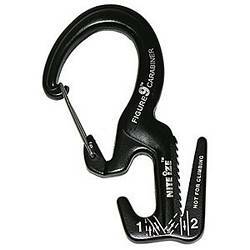 This versatile carabiner from Nite Ize is also a rope tightener. Just wind the end of a rope through the patented cinch system to tighten the rope... no knots required! The Figure 9 is perfect for camping, moving, boating or other outdoor activities.